Where next for breeding herd performance? Farm ideas worth investing in? Alternative bedding options – worth considering? Pig building investment plans? Let us know more..
Lady Gaga in the farrowing house?! Back to the drawing board..
How many gilts and how to manage them? Finishers - are you ready for a challenge? Sow care checklist – where to start? Is ammonia affecting wean to finish performance? Have you seen a drop in born-alive numbers? Do you have a success story? Managing parity profile to maintain a young herd: Younger sows are more productive and better able to rear a litter of 12 piglets. Paul used to do a couple of shunt fosters per week but rarely needs to any more. 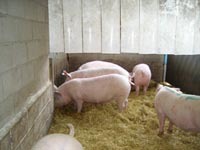 Using a ‘skip a heat’ policy: Paul allows six or seven gilts per week to skip a heat after their first litter and have another cycle, allowing the uterus to fully recover and also to regain any lost body condition. Paul says this always pays off for them and avoids the ‘second litter drop syndrome’ that can follow on from weight loss during a gilt’s first lactation. Get in touch with me if you’d like to discuss these ideas further or would like advice on any other aspect of breeding herd management.